I was away with friends in the South of France, and I was having the best time, but the availability of the kind of food that I love to eat there is very poor. The health food stores don’t even carry raw sauerkraut or sprouts, two of my fallback staples when organic produce is thin on the ground. I ate really basically for eight days, and when I got home I was starving. Not so much nutritionally, because I had been having my chlorella and maca and spirulina, so I was getting enough nutrients. And not even calorie-wise, because between avocados, olives and the raw chocolate I had brought, I was feeling satiated. But I missed the complex flavours of the foods that I make at home: the umami of miso, the lift of baobab, the heat of cayenne. So as soon as I got back, I made this bread, and it got me to thinking how the best recipes always come out of a longer process. 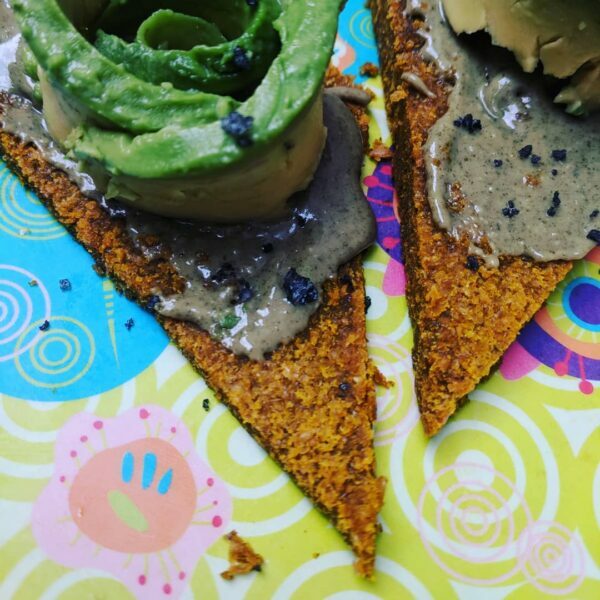 Despite the lack of exciting food, I had had a really wonderful time, and all those high energies I was feeling went into creating this recipe as much as the cravings. My primary focus in life is always my own personal self-development, and everything I create is a result of that, directly or otherwise. The recipes, books, classes, radio, yoga, dancing, it’s all different ways of expressing the truths and insights I uncover in my daily search for Samadhi. I think the power of authenticity can never be underestimated. The quality and even the intention of what we are sharing counts for little compared to feeling the impact of the depth of the place that it is coming from. So in the spirit of authenticity, I present to you the tastiest bread recipe I have yet come up with. Some things turn out good, other things end up feeling bad; sometimes we are right about a situation, other times we miss the mark: that’s’ just the way the world turns, but honesty can prevail through all these ups and downs, and that’s what keeps us on track, elevating ever upwards through it all. Grind your flaxseeds in a high power blender or food grinder. Transfer them to a mixing bowl, and add in the dry ingredients: psyllium, baobab, kelp, mushroom extract, turmeric, cane juice crystals, black pepper, and cayenne. Mix thoroughly with a spoon or by hand. Then add the liquid ingredients: the tamari, olive oil, and apple cider vinegar, and mix again. Lastly stir in the water until you have a firm dough. It’s probably easiest to do this by hand. Press the dough into a loaf shape on your dehydrator sheet. You don’t want the bread to be more than 1” (2-3cm high) or it won’t dry through properly. Put it in the dehydrator and dry it for 8-12 hours, then flip and dry for another 2-4 hours on the other side. Store in an airtight container in the fridge. Will keep for up to a week. I slice it in half through the middle and eat it as flatbread with avocado for lunch, or as an awesome snack with almond butter and honey. Hi Kate! What’s your take on ground flax and cyanide and what daily dose would you recommend? I made this (minus the cane juice crystals and cayenne) and it sure hits the right spot, thank you! Good base for further bread experiments I feel.